Published in the Dover Express, 14 December, 1979. After the appointment of Theobald to the Primacy, the Monks of Canterbury took possession, and then arose a quarrel as to who should elect the Prior, The new Archbishop appointed Asceilne, of Canterbury, as the first Prior of Dover, but the Monks, at the next appointment of a Prior, resented this interference with their internal affairs, and that contention prolonged itself through two centuries. Another dispute arose out of the claim of the Monks of Dover to join with those of Canterbury in electing the Archbishop. That claim was never allowed, but on one occasion, in 1174, by the King's influence, Richard, Prior of Dover, was elected Archbishop of Canterbury. These protracted contentions and litigation so drained the coffers of the Dover Priory, that the Monks of Dover were unable to continue the contest, and they were left with a debt which remained as long as the Priory existed. King Stephen died at this Priory, only 18 years after it was completed. Forty years later, the Priory was the scene of the violent arrest of Geoffery, Archbishop of' York, who, returning from exile, on landing at Dover, flew to the Altar of the Priory Church for sanctuary, which refuge was violated by a body of armed men, who dragged the Archbishop through the streets of Dover, and imprisoned him in the Castle. In 1295, the Priory was burnt by the French, traces being left in the Refectory and in the Gatehouse. On that occasion, all the fraternity fled with the exception of a very old monk, who was found sitting in his dormitory, and because he would not tell where the treasures of the house were hidden, he was slain. For this, his memory was venerated as that of a martyr. In a manuscript which formed part of the Priory Library (now in the Bodleian Library), is an account of "The Life and passion of Thomas de la Hale, Monk of Dover," slain by the French, and in the Cottonian MSS may be seen a sketch of his death. His shrine in the Priory Church continued to be visited by the devout up to the time of its Dissolution, and It was asserted that the dead martyr's virtues, in addition to curing the deaf, dumb and blind, had raised five dead people to life. The Sovereign had such faith in Thomas de la Hale, that he requested Pope Adrian VI to canonise him, but on his claims being examined, the Prior of Canterbury gave an unfavourable report, fearing that Thomas de la Hale of Dover might be a rival to Thomas a Becket. There are not many references in the records to royal favours or royal visits, although the Priors complained that their revenues were wasted in entertaining distinguished visitors. Henry II visited the Priory and granted them an annual fair; Richard I gave £100 - for additional buildings; in 1308 Edward II was there, and it is recorded that the Bishop of Chichester there delivered to the King the Great Seal. In 1487 Henry VII gave £20 for repairs of the Priory and Prior Humphrey seems to have made good use of it, for the report of the Commissioners who visited it in 1535 was as follows: "The house of Dover is well repaired in all places as far as we could perceive." John Lambert, the last Prior, had been in office nine years at the time of the Dissolution. Of him the Commissioners wrote: "The Prior at his first coming here found the house endebted, which he had reduced. Of his now case, divers of the honest inhabitants of Dover express themselves very sorry." The act of surrender which this Prior signed was in the following words: “We being assembled in our Chapter, and considering the state of our house, the small revenue belonging to it, and the great and heavy debt which oppresses and almost overwhelms us, and which can have no earthly remedy, have by the King's permission consented that this Priory shall be totally annihilated in spirituals as well as temporals.“ The nett income was then valued at £170 14s. 11½d., and the Monks numbered 16. Although the official report above quoted is favourable, the private information written to the King’s High Chancellor was different. Richard Layton, one of the Commissioners, wrote: "The Prior of Dover and his Monks were as bad as others, for they have no lack of women." It has been stated that these scandalous reports were untrue, and were circulated to prevent popular demonstrations in favour of the monks, and it does seem as though the Prior and Monks of Dover could not have been as black as they were painted, or the Prior would not have been allowed a pension of £20 a year, for, at Langdon Abbey, where the evil was flagrant, no pension was granted. After the Dissolution of the Dover Priory, the lands were conveyed to the Archbishop of Canterbury, and were from time to time leased to various persons. At one time they were let to the Papillon family, afterwards to the Fairbrace family, and at the close of the 18th century to John Coleman, and were continued to be held by the Coleman family until about the year 1843; when a large portion of it was granted to the late Mr Parker Ayers on a building lease, the remaining portion being acquired for the purposes of Dover College between the years 1870 and 1880. It was a fortunate circumstance that in the autumn of 1845, when the builder was laying out streets and commencing to build houses on the Priory estate, Dr Plumptre, Master of University College, Oxford, a keen archaeologist, visited these ruins. Mr Parker Ayers, the builder, materially assisted him in his investigations, but it is doubtful if any permanent records would have been made, but for the stimulus of Dr Plumptre’s visit for when he arrived, the zeal of the builders was directed to digging goodly stones out of the foundations of the church to raise modern buildings, rather than tracing out the extent of the ancient works. Mr Parker Ayers was then building Christ Church Villas, facing Christ Church. 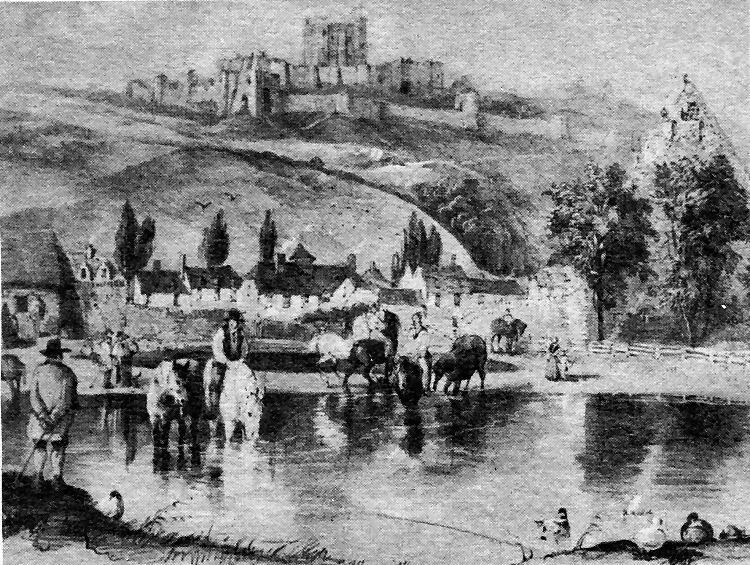 DOVER Priory Farm — now the site of Dover College — from a print published by Batchellor’s Library, at New Bridge, in 1828. Engraver was W. Burgess. On the original the Maison Dieu is depicted on the left. On the right is the Refectory building which survives to this day.